Anger is an emotion that usually brings out the worst in everyone and constantly gets people into trouble and more often than not, an outburst of anger causes the individual to do and say things that are rather unpleasant. Our life and the lives of those around us will be much better if we learn how to control our anger. It’s ok to get angry sometimes, anger is a natural, human emotion, but it’s not ok when we get angry often. It means that there is something wrong in our life. Anger is a negative emotion and can kill our happiness. If we spend a lot of time being angry, we can’t live a happy life. We need to control the beast within us and be the master of our emotions. Now let’s start with recognising the signs of anger. They can be emotional and physical. Now, what can we do when we feel the anger is raising? Suggestions – What can we do to control our anger? First of all, we need to make a mental note, so we know what to do when we start getting angry. # We can take a deep breath. Taking a deep breath not only gives us the opportunity to step back and collect our thoughts, but it also causes some chemical reactions within our human body that allow the frazzled nerves to be calmed. Our body will feel more relaxed and eventually we will feel the anger seeping away until it is no longer the focus of our mind. You might also like reading: the importance of proper breathing. Drinking some water is also another way to calm the nerves and creating a distraction for the mind and body to focus on. Besides it also has a positive cooling effect on the body system. # Avoid speaking when still in the angry frame of mind. When we are angry, we can easily say things to hurt people on purpose and then later we might regret it, so if we can’t control our anger, it’s better we learn to keep our mouth shut. We should also never make a decision when we’re angry, again we might easily regret it later. # We need to take a step back and/or Take a walk. Taking a walk will help to exhaust our anger emotions adequately enough for us to be calmer and relaxed again. Why don’t try Walking Meditation? Practice some meditation is also another way to distract our mind. 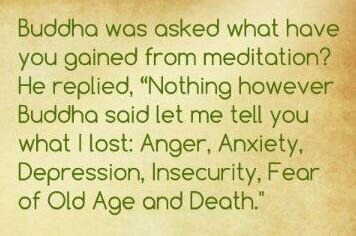 Meditation would effectively draw the mind away from the anger, thus effectively stopping it from creating disastrous consequences. Meditation helps the individual to get in touch with the inner self. It helps the individual recognize the anger emotion as destructive at the very primal level and address it accordingly. # We can remove ourselves from the situation in our mind. Another one of the very useful anger management techniques is to completely remove ourselves from the situation in our mind. We can close our eyes (only if safe to do so) and imagine ourselves in our happy place, somewhere that makes us feel good and stress-free. Now that we know how to react when are angry, we need to figure out why we are getting angry all the time and fix it. What is causing our anger? The first step to managing our anger is to identify exactly what is making our anger arise and then working to fix it. When we start feeling that our anger is ready to erupt, we need take a look back at what led us to this state. Was it something someone said? Or is it something that happened in the past that’s triggered by a current issue? We need to give ourselves time to admit we’re upset and then to figure out why. # The fear of something. People often react in anger, when they are fearful of a particular problem, occurrence, action or basically anything they perceive to be out of their control. There are ways to overcome our anger issues by dealing with the elements that cause the fear. Frustration, in a particular area, can eventually lead to the fear factor creeping in and taking over the individual’s mind and thoughts. The fear of being unable to come up with suitable solutions can easily lead to anger. If we are not happy with our life, with our job, or relationships etc, we live with a sense of dissatisfaction that can easily lead to anger. We need to figure out what makes us unhappy and change it. If we can’t change it, we need to change our attitudes. You might also like to read: happiness is an attitude of mind. Recently a lot a research has been able to show that depression can lead to unprovoked anger outbursts and this are not just for isolated cases but is becoming a very common occurrence. More people are finding that their depressive state is causing them to seek retribution in anger and this is an alarming phase to be in. Understanding the causes of the depression may in some cases provide the relief and solutions that will help to eradicate the underlying problem. If we think that any of the causes listed above are the cause of our anger, we need to do something about it. If we don’t change nothing. Nothing will change! If we are filled with positive thoughts, it is only natural to react in a positive manner to anything and everything that comes our way. This is an advantage of constantly feeding our mind with positive input. Striving to have a healthy body and mind will also allow us to create a positive mindset. You might also like reading: How to replace our negative thoughts with positive thoughts. # We need to take responsibility for our own actions. A very important aspect of dealing with anger related problems is by realising that it’s not always everyone else’s fault. It’s not also the fault of the situation, it’s our reaction to the situation which creates anger problems. Instead of looking to blame someone, a more productive exercise would be to look for solutions to the problem. This will engage the mind and body actively and thus eventually cause the individual to forget to blame anyone and anything for the circumstances. # We need to reduce the stress we have in your life. We need to find some time for Relaxation. The important thing about relaxation is that it takes our mind off the things which are making us stressed in the first place. # Don’t dwell on the past. # We need to learn to listen. Misunderstanding normally is caused by the lack of communication or ineffective communication. Therefore practicing and developing the skill of communicating clearly and precisely will help all parties avoid any conflict. People fail to communicate properly due to their inability to first listen carefully to what is going on. You might also like to read: Can Effective Listening improve the Happy Level of our Life? #Learning how to look for simpler ways to tackle a particular commitment or exercise is something worth considering. The simpler the process, the easier it is for us to execute it and thus keep our emotions such as frustrations and anxiety at bay. This will help us put everything into perspective and prioritize only when necessary. Therefore everything would become clearer and we would not have to stress about getting everything done at once. # We need to learn to let go. Learning to master the art of totaling letting go, would require the strengths and skills of the individual to “teach “ the mind to refocus and concentrate on positive elements. # Talk about our anger. Learn to talk about our anger can be an important method of therapy for anyone who is learning to deal with anger issues. It is then a good idea to talk to the person who makes us angry and try to come to a satisfactory solution. We need to tell them why we feel angry and what happened to trigger our reaction. Probably they will realise that they made us angry, but they will have no idea why, and to discuss the situation calmly can be a positive experience for both parties. # Channel our anger through writing. One important exercise which can be used to help with anger management control is by simply writing down a number of things which make us angry. This can be enlightening, as to actually have to write the specific triggers which make us angry can be a very good place to start when learning how to deal with these triggers. Research shows that chronic, high levels of anger are directly connected to an increased risk for health problems. How often we express our anger and how we express it during periods of emotional distress are significant determining factors in its impact on our health. When we get angry stress levels rise, heart rates increase, blood pressure rises. All of these are negative effects and when experienced repeatedly, over an extended period of time, can have disastrous effects on our health. A typical example is driving. Road rage is an epidemic these days and driving angry can be dangerous. Driving in anger can impair our judgment and it’s unsafe to us, to our passengers and the drivers around us. While it might feel good when we’re in the heat of the moment, expression of anger often leads to feelings of guilt, embarrassment, shame and remorse when we realize that our reaction was probably a little overblown. This results in damage to our self-esteem. You might also like reading: Having a High self-esteem can help us to be happier. Before I started my personal development journey, unfortunately, I have to admit, I was quite an angry man. It was like someone was pressing a button and bang, I was getting angry and ready for an outburst. In my mind, I thought I had the right to get angry and it was never my fault, I was the victim all the time. I realized that I had to change something. The main reason for me to get angry was my job. At the time I was working as a minicab driver, a private driver, and I was doing the night shift in the street of London. You can imagine, it wasn’t an easy job, dealing with “runners” that didn’t want to pay, dealing with drunk people and a lot of abuse and sometimes I had to defend myself from physical assaults. I was constantly on the edge… On top of that, I didn’t like the job at all, I had left Italy to improve my life but instead, I was stuck in a job that I didn’t like at all just because I had to pay my bills. I decided that I had to do something about it and I did. Now it all belongs to my past, obviously, I can still get angry sometimes, anger is a natural human emotion, but now I know how to control and channel my anger. So, if I managed to do that, I can’t see any reasons why anyone else can’t learn to manage their anger! Anything is possible as long as we really want it. To the next time and feel free to add any comments below.